Great Strides 2014 – hold the date! It’s that time of year again: Great Strides is just around the corner. If you’re interested in walking with us this year, please block off Sunday May 25! We’ll be posting more info about the walk shortly. We’re doing something new and creative with this year’s Dow family Great Strides video and we may have a few other tricks up our sleeves to help raise awareness and raise more funds. Last year, we raised $17,000. Let’s see if we can beat that number this year! 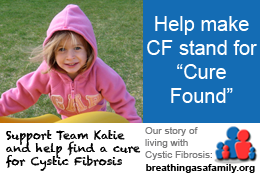 ← Team Katie – Great Strides 2013 results!